Need to Retreat to Mexico? There is nothing like a warm break from winter where several hours of yoga are wrapped up with relaxation or special excursions in a tropical climate! Doing yoga in fresh air in an outdoor studio or on a beach while learning new meditation, pranayama and asana techniques can be inspirational to a stale practice. And removing yourself from the busy-ness of life even for just a week creates a sacred space for rest and renewal! Each year SOYA teachers hold the 200 hour yoga teacher training is Mexico. Consider joining us in this lovely warm climate! Find out more! https://soyayoga.com/wp-content/uploads/2014/10/beach-yoga.jpg 373 541 Robert McConnell https://soyayoga.com/wp-content/uploads/2013/08/20-logo-training-excellence.png Robert McConnell2014-10-31 13:52:282018-08-08 11:16:55Need to Retreat to Mexico? By Dorothy Fizzell, SOYA, IYTA, ERYT500, mom and grandma. If you are a yoga teacher, and you have children, do you do yoga with them? Or is it something you do separate from raising your children? Or, are you a parent/grandparent of young children, who also participates in yoga classes? Do you share the knowledge with them? There is a quote from Eyre in 1984 that defines play as “What joy is in the body! The joy of work, and of hard, purposeful effort, the joy of singing, the joy of sport and activity, the joy of tenderness and physical touch, the joy of controlling physical things!” This is also a perfect definition of yoga asana!! Children love to move! Yoga is a natural extension of what children already do, and sharing yoga, as with other aspects of bringing up children to be positive, confident, healthy, contributing members of society, can be exciting. As a yoga teacher, with young children, I did not spend much focused time sharing my passion with them. There were, however, many spontaneous teachable moments, while I was doing my personal practice, or preparing for teaching, that my two sons did become aware of what yoga is. I used photos of my ten year old son, Karl, in my specialty project on “Yoga for Preschool children”. It was enjoyable to answer their questions, to pay attention as they said “Watch me!” and to demonstrate breath and body movement, sitting still, as well as model some of the yoga philosophy such as yamas and niyamas. 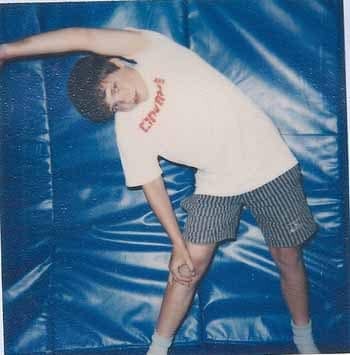 Karl, doing Trikonasana at age 10. Yoga can be extremely important in a child’s life. Just as with adults, life for even very young children can be very structured, busy and competitive. Yoga, in children, can reduce stress, can improve body awareness, strength and flexibility and can improve self-discipline and self-confidence. And with concerns about children not being active enough, yoga is perfect! Play is the most important aspect of a young child’s life and is the major method of learning. When yoga is done in a fun, natural way, children will learn it. It is exciting for them to use the Sanskrit language, and they love to show and feel how their bodies move in space. 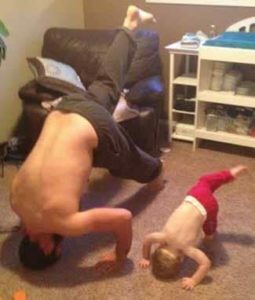 As parents, or grandparents, we can involve children in our yoga practice, challenging them, having them use their imagination, with all the same yoga asanas, the same breath techniques, the same meditation techniques. We do need to be mindful of the “dos and don’ts”, of not having to be precisely aligned, and we need to modify accounting for different body proportions. Doing yoga with children also teaches us, as we open our minds to children’s perspectives, as we develop patient calm when they want to repeat and repeat again, as we move with more ease and relaxation, having some laughing moments in a yoga asana. And…who knows, your child may then pass yoga onto their children! Karl, doing Sirsasana prep/ Svanasana with two year Odin. Bob and I have just returned from a 5 day yoga teacher’s training with Erich Schiffmann at Exhale Yoga in Venice Beach. I always look forward to continuing to learn and deepen my knowledge of yoga. Even though Bob and I have trained for more than 100 hours with Erich since I first experienced his yoga in 2005 we are continually so very grateful for his depth of spirit and incredible ability to inspire our personal practice. So what makes Erich so different from other yoga teachers? Of course the asana is awesome… it starts so easy and then the next thing I know I am in something so very deep and I wonder how I got there! His hip-opening sequences create amazing space leading to the ultimate achievement of the lotus position. His back-bending is delightful to watch, and his dog sequences are liquid as they open up the heart. But it isn’t so much the asana that is so incredibly inspiring, it is his union with the Divine that takes me to places beyond. Erich has trained with the best of the best… He studied with Krishnamurti and taught yoga for many years in Krishnamurti’s Brockwood School in England. He lived in Madras, India for a year and studied with Desikachar. He studied with Mr. Iyengar in Poona, India in the 1970’s. He studied with Dona Holleman and Vanda Scaravelli in Italy. And in USA, Joel Kramer made it all click for him by taking it beyond the physical to an understanding of the flow of energy. According to Erich, self-trust is the advanced technique of yoga… as you trust YOU, you are trusting in the ALL. We learn self-trust through the practice of meditation – regularly – on and off all day. Start when you wake up in the morning by sitting up in bed with pillows supporting your back. In that early stage of waking, enjoy the inner quiet as you enter your day. Let those insights come into your mind and then trust them. With self-trust you are opening up to the Universal Wisdom. As you think less, and listen more… then “new knowing” will flow into your mind. Erich lives his yoga ALWAYS. “Yoga is a lifestyle, which means living it all the time. ‘All the time’ is the new NOW that you are in all-the-time.” Whatever comes into your day, good or bad, it is your “new now” and how you handle it is a reflection of your state of yoga, your current level of consciousness. We are very excited about Erich returning to BC next June 5-7, in Sorrento, BC at Sorrento Centre where he will help us celebrate 20 years of SOYA! He doesn’t come to Canada often so we are really very fortunate that he is making the trip here. Registration for this event will open in January 2015, so be sure to register early! To be or not to be a Yoga Teacher? Submitted by Jeff Lutes, RYT500, E-RYT200 from Prince George, BC. There are profundities in many experiences in life. We have the opportunity to experience them every moment of every day in the interactions we have with people, our environment and with ourselves. This is what I learned in my Yoga teacher training. The experience of teacher training itself was unexpectedly profound. When I began the training I had been doing Yoga on and off for about ten years. My interest in doing Yoga teacher training was not to become a teacher but to learn more about the ancient practice and to understand the philosophical foundations better. What occurred in the SOYA training was much more. At the time, it was like a magnificent dive into the infinite pool of energetic power that exits in the universe and how we as individuals embody, contain and manifest that power. Today, the lessons learned are a source of inspiration that I can draw on when I feel an illusory dark reality descending. The experience of teacher training is to be in an ideal nurturing environment. While I would imagine there are some teacher trainings where group dynamics may go sideways, what I experienced and what I have witnessed others experience is that as an individual you are immersed into a completely supportive group environment. It is recognized through constant dialogue, re-enforced by the philosophical texts that we all come to the mat with our own respective dysfunctions and that it is these dysfunctions that make us who we are, the unique individual expression of the universal energetic source. The teaching is constructive, the texts and lessons learned are all about positive intention and energy. The constant theme reinforced is to learn to accept and love yourself and others with your best possible effort. Whatever it is you can contribute towards achieving that-it is enough. The experience is framed within an ancient practice of holistic well being, a physical and mental cleansing of the body and soul, ten to twelve hours of concerted application of well being per day. Morning kriyas (cleansing techniques), daily pranayama (breath and vital energy manipulation) practices, two or more times per day, to help balance and cleanse the energy channels in our body, mind and soul. There is Asana practice twice per day to stretch and strengthen the physical body and build capacity within to maximize the application of the increased vitality built throughout the training. Through this daily work we inevitably encounter our own personal limitations and obstacles towards our goals. These become our challenges and as they are recognized they are learned from. The group of students in the training all face challenges and the magnificent thing that takes place is that we begin to apply the philosophical framework for the discipline and practice of Yoga-love and compassion towards our fellow yogis. We learn from each other and realize that as we are compassionate toward others we learn to be compassionate with ourselves. As others are compassionate towards you (the individual you) you begin to see the positive feedback loop strengthening. You become stronger the more love and compassion are experienced. This is the ultimate lesson, we are learning beings, built to absorb the lessons of the environment and world around us, and when properly enforced with positivity and prosperity of spiritual growth lessons, we manifest the true nature of our beings, lightness and love. By the end of the training it is not as if you have become a permanently enlightened being. Though euphoria and glimpses of the infinite universe led me to think I had achieved permanent enlightenment, the reality that it was not so was a major bummer. For most, the embodiment of lightness and love are fleeting experiences, throughout the training and in life. In teacher training though, when these moments of enlightenment arise, they are nurtured and the experience may linger longer than it otherwise would have. The moment of enlightenment will probably pass though and we encounter the challenges within ourselves once again. This is a natural ebb and flow. The highs of these experiences are amazing and in the context of the training the lows are made less by the support of those around us. The difficulty is in applying the experiences of what we learn to our every day lives. Re-entering reality can be challenging. Describing your experiences to others who have not done a teacher training or do not understand the practice and principles of yoga can be met with ponderous looks of bewilderment and disbelief. In the teacher training you have been surrounded by reflections of your own experience, and the magnification becomes brighter and enhances your own experience. In your normal reality the reflection may not be as bright or exist at all and as time goes by the magnification of the reflection diminishes within yourself. The framework of positive re-enforcement disappears and it is up to you, on your own, to keep the light shining. Many people are overwhelmed by this prospect. I am one of those people. Within this there is a vital lesson though. While it is up to you to maintain the discipline and path in the experience of lightness and love, understand that what the environment of a teacher training provides is a community of people to keep the flame burning strong. It was through the experience with others and the provision of compassion and love to others that created a brighter flame within the personal individual experience. The lesson within this is that while the community you live within may not initially embrace your knowledge with open arms, trust that there is a community who will. As you seek out and find that community, the continued application of the lessons of lightness and love will only serve to help the people and loved ones who viewed your knowledge with skepticism see the brilliance within what you have to offer. Maintaining the lessons learned is difficult but through persistent effort the benefits will continue to grow and the experiences of enlightenment will become more and more natural. There are different options for how one can do a teacher training. I did my initial training as an immersion-it began with completing a number of philosophical lessons at home on topics like chakras and the Gita, followed with an immersion of 16 days/12 hours per day. Another method is to do it over a longer period of time. Some schools provide opportunities to do it over three or four months, every other weekend and other schools provide the student an opportunity to work toward a certification in several short modules which amount to the required number of contact hours with approved teachers. Obviously there are no right and wrong ways of going about getting certified as a teacher. Each method has its own strengths. Going the immersion route seems to manifest more dramatic shifts due to the consistent application of the lessons from Yoga day after day. The armor most individuals have built up over the course of life is stripped away quickly. A few days of feeling raw and vulnerable may take place but the support of those around you helps to ease the difficulty of the process and feel open to the depths of the practice of Yoga. The result is both a positive and a challenge. Due to the immersion the cathartic changes that take go to deeper depths. The realm of constant positive re-enforcement forms a more innocent integration of the lessons learned. Upon re-entry into regular life the bluntness of reality may overwhelm the innocence. A trust is required that the seeds of what were planted during the training will continue to grow as long as they are nourished. Doing a teacher training over a longer period of time gives one the benefit of integrating and experimenting with applying the lessons over the few months the training takes place. The stripping of armor may not go as deep though. The constant reentry into “normality” may cause a student to put the armor back on before they have experienced the lessons of what vulnerability has to offer. It is a more pragmatic learning experience and as such has its obvious benefits and limitations. Whatever a student chooses to participate in will be beneficial to themselves and the world as a whole. There is nothing to compare that one is experience is better than the other, rather, it is important for a student to choose what seems right for them. Acceptance, love and compassion are fundamentally important experiences and attributes to have in your life. These form the foundation for a healthy community. Understanding and experiencing these through a Yoga teacher training has a profound long term impact on your own reality. Other experiences may happen during the teacher training. Through the consistent balancing, cleansing, strengthening and stretching or our energetic beings some interesting shifts and happenings can occur. The subtle energies in our mind and body and spirit can manifest cathartic energy explosions that have profound impacts on our understanding of ourselves our own energetic connection to the universe around us. In some form or another a student will experience a connection to the Chakras, the raising of Kundalini energy and a depth of connection to the vital life force-Prana. The connections may be subtle or may be dramatic. What is certain is that a student can experience and learn that the energy they are comprised of is as magnificent and mystical as the energy contained within the power of nature that surrounds us. What is important to learn, whether you have done or will do a teacher training, or if you are a regular practitioner of yoga, or an aspiring practitioner, is that all of this, yourself and our universe are profound. We see the profundity every day and it is this that sparks the awe of our unique, individual and collective reality: the smile on the face of someone who needs to make a connection to community and does so, the amazing power of the natural world we live in, the power within ourselves to be compassionate and loving towards others, this is what our practice is about. Acknowledging that. It is profound and yet the more it is practiced, the more normal it becomes. Jeff Lutes is an enthusiastic teacher of Hatha yoga with a little vinyasa, power yoga, the yoke, and good times thrown in. 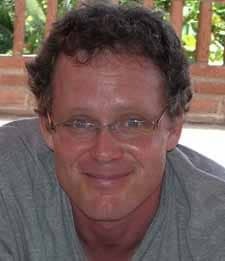 He is an owner of Chinook Yoga in Prince George and our newest addition to the SOYA Lead Trainer faculty. https://soyayoga.com/wp-content/uploads/2014/10/SOYA-Yoga-Teaching.jpg 281 375 Robert McConnell https://soyayoga.com/wp-content/uploads/2013/08/20-logo-training-excellence.png Robert McConnell2014-10-01 12:06:462018-08-08 11:33:37To be or not to be a Yoga Teacher?